Bonsai and Jerry Miller at Boone Valley on Aug. 28. Photo by Dave Traxler. 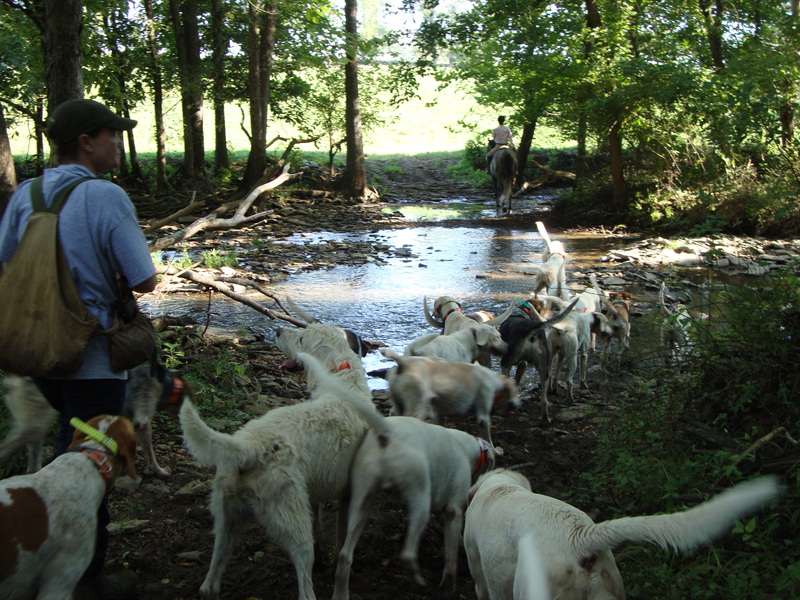 Summer hound walks are over now that huntsman Lilla Mason is on horseback and the hounds’ exercise picks up speed. Now our attention turns to the hunt season ahead, but not without some lingering memories of fun times from the summer just past. 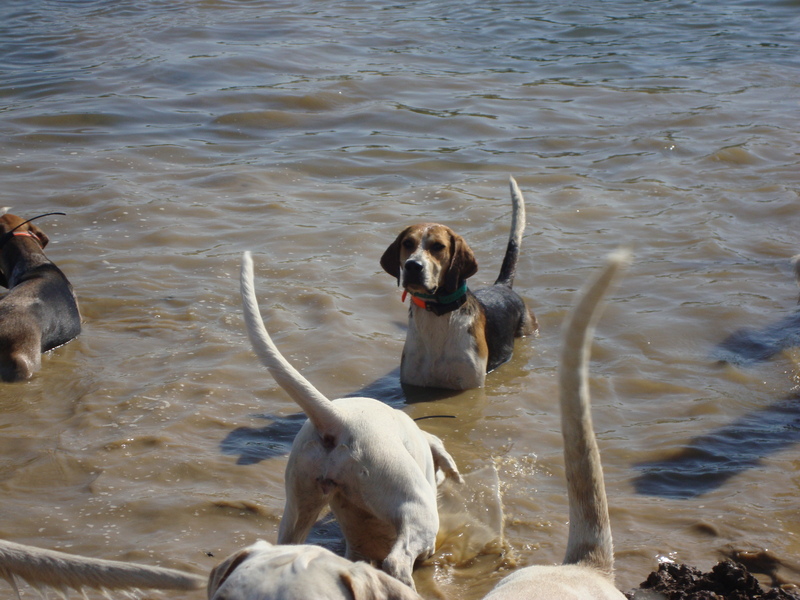 To celebrate the start of September, we’ve got the above video and a Smilebox photo slide show (see below) of some of the Iroquois hounds’ summer moments. We hope you enjoy reminiscing about the summer as much as we did! Bonsai, Barman, and Jerry at Boone Valley on Saturday. 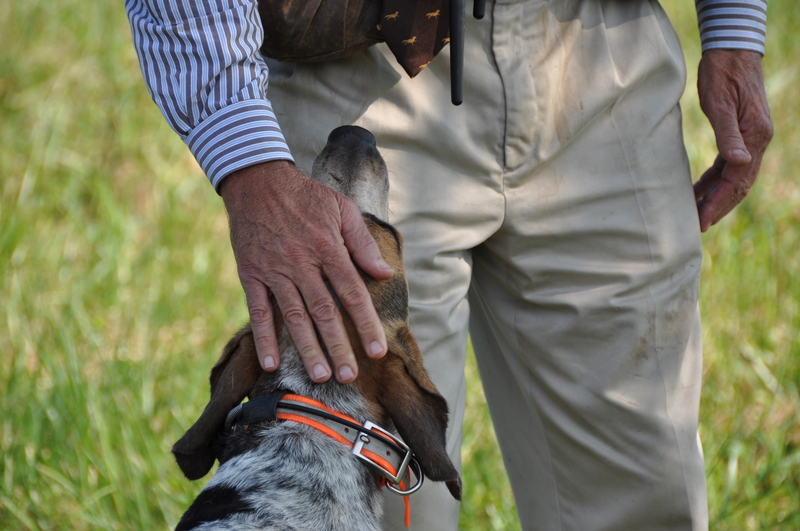 YOU can now view selected posts from the hound blog at Norm Fine’s new website and internet foxhunting hotspot, www.FoxHuntingLife.com. Check us out just “below the fold” on the homepage: just scroll down a hair when the page opens, and there we are. Stay tuned for more posts from the hound blog there. Norm’s site also offers expert advice, a news digest from around the world, and a photo gallery. Never let it be said that the houndbloggers don’t give equal time to the hounds’ quarry. We’ve already given a summary of Dr. Stan Gehrt’s outstanding presentation on the urban coyote, and now we turn to the bunny. Our friend the rabbit was last seen in these pages darting in and out of the native grasses, with beagles and bassets in hot pursuit. But what do bunnies do in the off season, when they’re not giving beagles and bassets fiendishly clever puzzles to sort out? You’ll never guess. The answer, from England’s Daily Telegraph, via Denmark: they compete in showjumping (or, as it is properly called, “rabbit hopping”). Click here to read the Daily Telegraph article. You must see the video. It shows the winning bunnies’ performance in high jump, long jump, a straight course of jumps, and a traditional showjumping course. No, I’m not kidding. Many thanks to Cheryl and Ivan Bunting, who sent us these photos of their future stars in Australia. 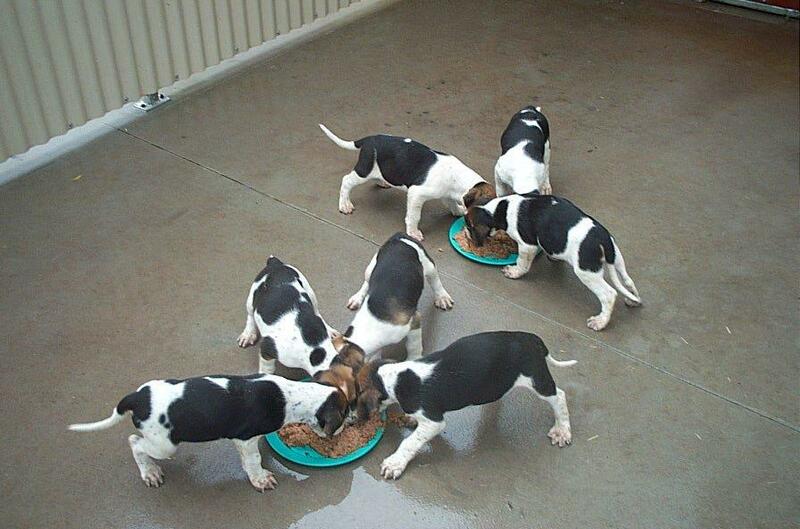 PUPPIES were in the houndbloggers’ inbox the other day, courtesy of Cheryl and Ivan Bunting of Australia. The Buntings were writing to let us know that they read the Hound Blog in Australia, which made us happy to hear, and they also mentioned that they have a new pack of hounds down under, the North East & Border Foxhounds. We’re hoping to hear more about the Buntings’ adventures as they found a new pack, starting with these young fellows. As you know, the houndbloggers are suckers for cute puppies, and the Buntings appear to have plenty of those! These were four weeks old when the picture was taken, according to Cheryl. 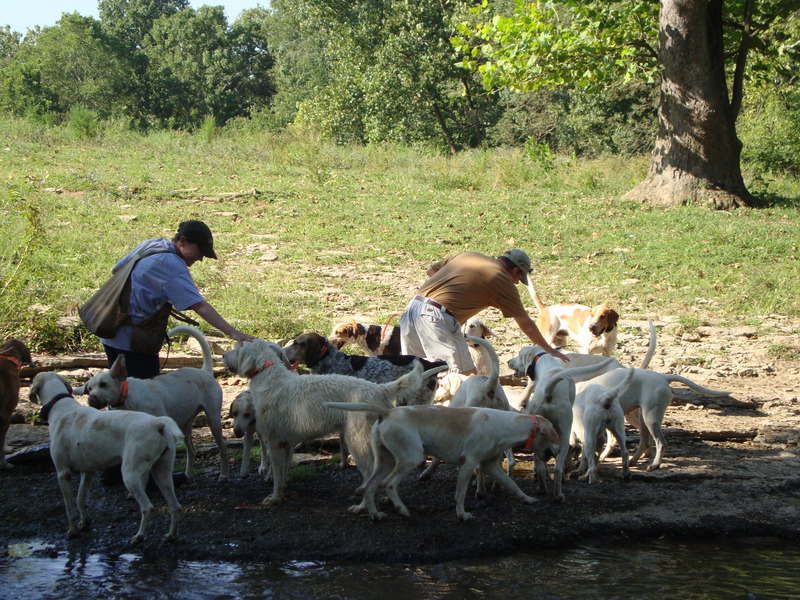 “We are just starting off with a good draft of hounds from an old established club who my husband Ivan was huntsman for, hunting hounds for 13 seasons,” wrote Cheryl. Good luck, Buntings, and we hope you’ll send us more photographs and updates as your hunt develops! 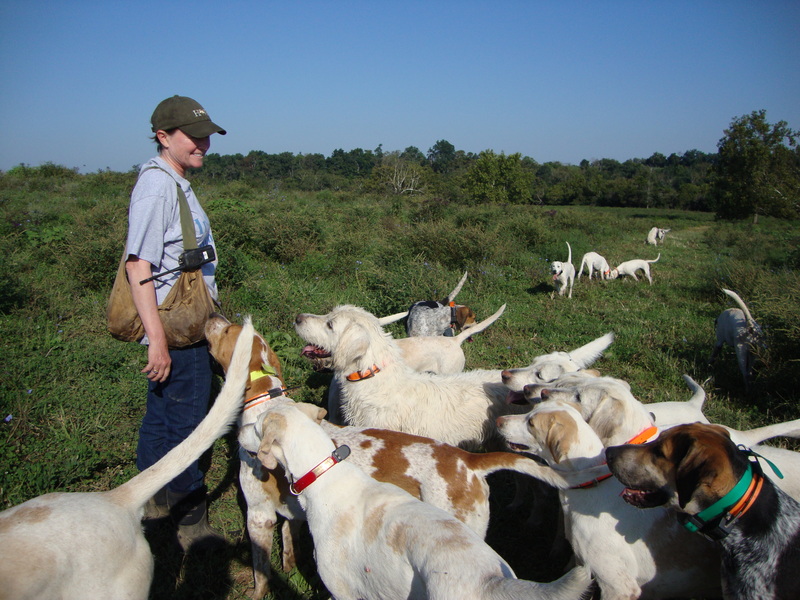 The hounds with huntsman Lilla Mason on their Aug. 26 walk. DID you catch a whiff of it this morning, too? The faint scent of autumn? The houndbloggers did. I love the smell of autumn. It reminds me that, no matter how miserably hot the summer, cooler weather–and hunt season–are right around the corner. Cool temperatures also sharpen the hounds’ senses. They’re also fitter, and the puppies (Driver and the BA litter, all just over one year old), who have yet to join the pack out hunting, are getting clued in to the fact that there’s a point to all this training they’ve had on summer walk. By the way, they seem to be asking now that the air is cooler and morning scents are stronger, what’s that delicious smell? A keen, fit pack of hounds plus cool air plus scent lines could equal chaos. The Iroquois hounds are keen, all right, but they were remarkably relaxed when the houndbloggers joined them on summer walk this morning. Their lessons about cattle also seem to be sticking. On Wednesday, Lilla brought 17 couple out for hound walk only to discover an entire herd of cattle had crowded up to the front of the field where she walks the hounds. Everything, at this point, can provide a good lesson for hounds that are almost ready to hunt–especially for the puppies, who are nearing their debuts with the working pack this fall. When two young women accompanying the hound walk on horseback began chatting, Lilla pointed out that the extra voices–while not ideal in the hunt field–could be useful today. The hounds rushed into the pond, eager to play in the own waves and catch the biscuits Lilla threw to them. Paper, now an old hand at summer training, simply stood and waited for a biscuit to come his way. "Toss a biscuit over here, please," says Paper. “They’re ready to hunt,” Lilla said. “There’s not much else I can teach them on hound walk. They’ve learned to stay behind when I need them to, they’ve learned to stay with me. We’ve hit lines on certain days and gotten them off those and settled back down again. You can see that they’ll trot off and then turn around and check on where I am. I’m still carrying biscuits, but I’m not using them very much. Lilla believes one reason the hounds stay so relaxed out walking even at this energizing time of year, is because the Iroquois kennel provides a lot of turnout. The hounds give themselves plenty of exercise in the 15-acre fenced paddock adjacent to their kennel, and even that has offered some unexpected training. Three deer, Lilla explains, have taken to jumping into the hounds’ turnout pen. That gives the hounds more opportunity to get used to –and ignore–deer and their scent, and it seems to be working, because the deer keep jumping in. That’s a sign they don’t feel threatened by the hounds, which means the hounds aren’t pursuing them. Pats all around from huntsman Lilla Mason and kennel manager Michael Edwards as the group pauses at Cormac's Elbow. This seems a good time to get an update on Driver, whose first hound walk we remember so vividly! How has he progressed since June? There have been some surprises about this pupposaurus, Lilla tells us. “He’s doing well, but he’s gotten shy a couple of times,” she explained. “One time we had to walk by some work trucks, and he was shy about that. I hope that was just because he was exposed to a new thing where he normally walks and that the shyness is something he’ll get over. But it’s something for the whips to keep in the back of their minds when we start hunting, to make sure nothing happens to make him scared or that, if he gets scared, he doesn’t get left behind, or something like that. “That’s what the summer is for, to file away little personality traits or issues that might surface later and cause a problem,” she added. This hound walk also marked the return of two much-loved English characters, Samson and Barman. Both haven been off in recent months due to health issues. Samson, whom you probably will remember very well as the opinionated traveler, had a tumor removed from his right hind leg back in February and looks to be back in good form. No doubt he’ll be glad to get back to hunting! Last season, despite his imperious style at the airport, Samson turned out to be a surprisingly laid-back hound who also helped another import, Strawberry, figure out the new surroundings shortly after their arrival from England. Barman was taken out of the hunting pack after having a seizure and is now doing very well on the anti-seizure medication phenobarbital. Fortunately, both phenobarbital and potassium bromide–the two treatments of choice for seizures in dogs–are both highly effective and relatively inexpensive. Barman, one of the kennel's Big Men on Campus. Phenobarbital is something the houndbloggers know a little bit about, thanks to our late king of the household and his successor, Felix and Harry. Felix had epilepsy, and Harry, too, has had seizures regularly; in both dogs, the seizures were controllable by one or the other medication at a very doable price. We’re very glad to see two of our most personable hounds, Samson and Barman, back at work! An occasional series in which we wish our readers a happy good night, courtesy of hunting literature. Sweet dreams! IT never hurts to look for wisdom in other disciplines, and it’s in that spirit that I picked up a copy of a book about sled-dogs. I’ve never had any particular interest in sled-dog racing, but I guess the reason I reached for this book was because of our recent post that featured a great video of their summer training as well as a nice description by New York Times writer Verlyn Klinkenborg. Whatever the reason, I picked up a copy of Winterdance: The Fine Madness of Running the Iditarod. Whether or not you care about the Iditarod, this book is a real find. It’s the story of how the author tried to build an Iditarod-caliber dog team out of a pretty random selection of dogs he scrounged from pretty much everywhere–and with shockingly little knowledge or experience of his own. Along the way, he learns a hell of a lot about dogs and gets some magical glimpses of wildlife. On one long-distance run, his team “adopts” a coyote. Later, a chickadee rode along on the edge of his parka and would take food from his hand as they zipped along on the sled. “Napoleon once said good morale among troops is as four is to one, and something similar happens to sled dogs. As they gain strength from training, and knowledge and confidence, as they understand that you will give them beef when they run and fat when they run and love when they run and your soul when they run, as they learn to feel that, understand that, know that, they become something completely different. They are no longer just sled dogs or pets–they become distance dogs, dogs that cannot, will not be stopped. “On a light rig, ten or twelve sprint dogs could be run easily. So I was told and so I did. 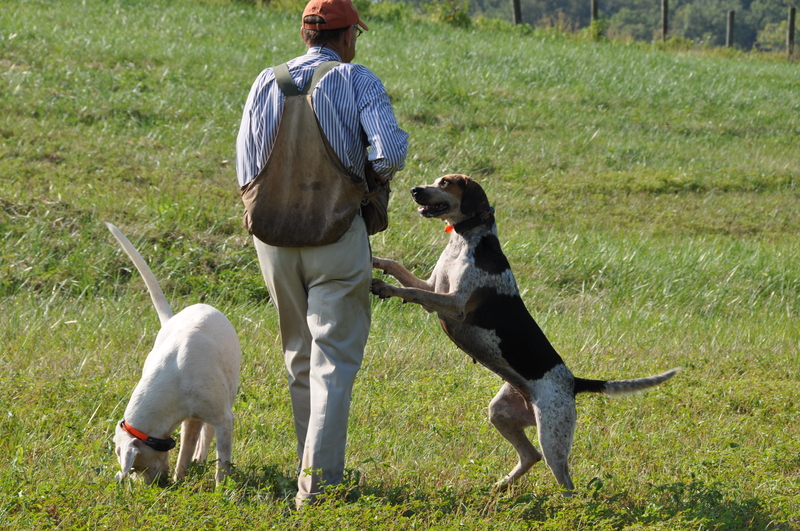 But with distance dogs in good shape on the same rig you should never use four or five–not if you expect to live. And the magic number–seven–should never be exceeded on anything less than a full car body (which I later used) with the engine gone. Something happens between the seventh and eighth dog that is truly phenomenal. A power curve is passed and with eight and up you’re in a zone that defies control without special gear. “I knew none of this. Once I had the light rig I started getting dogs, adding them to the overall team as I found them. … I ran them the way I thought I was supposed to run them, putting new sections of gangline on as each new dog or set of dogs arrived and just adding them to the team. “But a kind of infection of will had occurred that I hadn’t understood. I had the trapline team, the original seven. They had been nice dogs, happy dogs, peaceful dogs. I had worked them all winter and never had a problem with them, especially Cookie. I frequently brought her in the house and let her run loose. That original team was easy to control, though already very strong, and I thought it would help me to gain and maintain a control over the new dogs. “It went the other way. The trapline team became a distance team and the problem came about because they were already in shape from running all year. The other dogs, the new dogs, the wild dogs, the Canadian dogs, the native dogs swept the old trapline team up in their wonderful madness and I … I was just part of the rig. “My first run with a large team was the classic one, and should have warned me about the rest of them. I had decided to run them a little long. … So I thought I would try thirty miles. It isn’t much–not even a third of the hundred or more miles first runs should be–but it seemed like a long way and I thought I should carry some gear with me. I loaded the rig down with a backpack tied in place and a box of dog food, a tent, a rolled-up tarp, a winter coat–just in case it cooled off–pots and pans for cooking, a small ax, a bow saw, a lantern, a gallon of fuel for the lantern, and a full-size, two-burner Coleman stove. “I don’t think the rig hit the ground more than twice all the way across the yard. My god, I thought, they’ve learned to fly. With me hanging out the back like a tattered flag we came to the end of the driveway, where we would have to turn, must turn onto the road. “The dogs made the turn fine. “The rig started to as well, but I had forgotten to lean into the turn and it rolled and once it rolled it kept rolling–it felt like two or three hundred times. I had time for one quick look back–it seemed like a dry goods store had blown up across the road and in the ditch–and grabbed at something to hold. “In some fashion I don’t understand I hug on–I think because I’d lost them [before] and was determined not to lose them again–and we set off down the road with the rig upside down, all the gear gone, and me dragging on the gravel on my face. “It took me four miles to get the rig up on its wheels, by which time the pipe-handlebar I had welded into position had broken off and I had nothing to hang on to but the steering ropes. I was also nearly completely denuded, my clothes having been torn to shreds during the dragging. 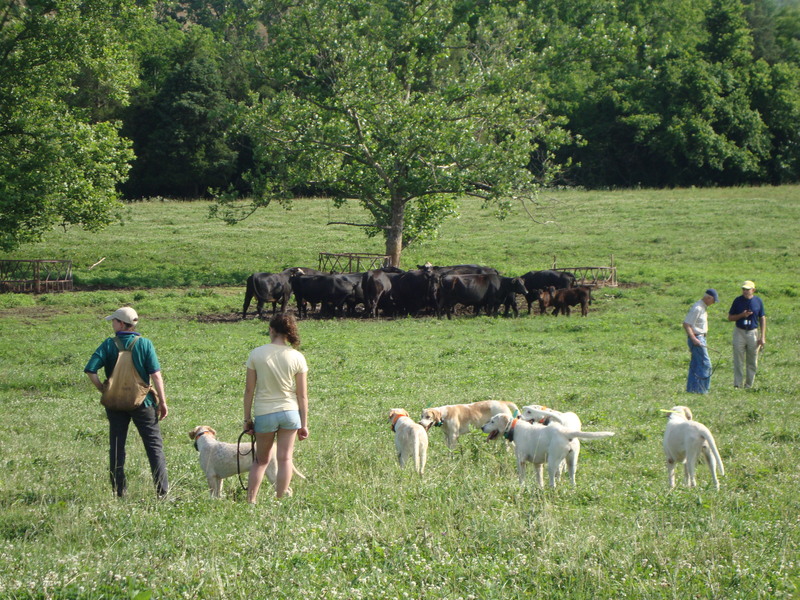 Getting hounds used to cattle is an important part of the summer training regimen. CATTLE are boring. That’s the message Iroquois huntsman Lilla Mason wants to give the hounds. Whether or not you happen to like cattle, or even find them exciting, it’s important that the hounds find them as unexciting as possible. Why? Farmers don’t like their cattle to be chased or harassed, and it doesn’t aid in chasing the quarry–coyote, in our case–if the pack decides they’re too interested in visiting with the cattle in a field the quarry has run through. 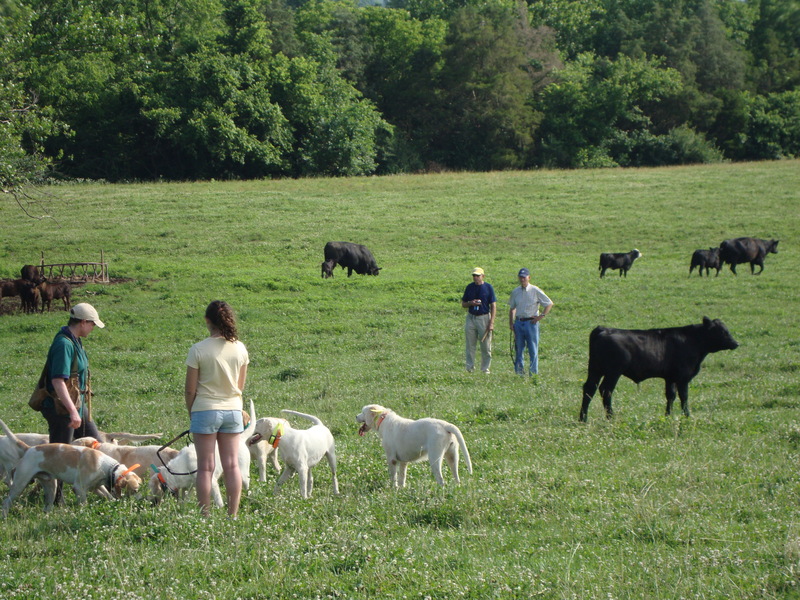 But hounds (and especially puppies) are curious beings, and so are calves. Letting the two populations meet and find each other dull company is something that has to be managed carefully. “In our training program, our goal is to let the hounds investigate something, make the right decision, and learn from that,” explained Lilla. “What you don’t want on hound walk is, every time you get around cattle, the whips and I get nervous and all the hounds want to do is, like a child, the thing you tell them not to do. That’s what you don’t want. What I prefer is for them to go out, investigate the cattle, maybe make a mistake, but see the cattle and get bored with them. “What you don’t want to do is create a situation where the cattle were fun and it was fun to chase them. You want them to get close to the cattle and smell them, get around their legs and maybe get pushed around by one, things like that. You don’t want them to find a lone calf that runs and they chase it. Then you’ve got more homework to do, because that was fun. A lone calf that runs away from the hounds can present a particular temptation. By mid-July, the year-old puppies Driver and the BA litter had seen and smelled plenty of cattle at The Pig Lot under circumstances that usually weren’t very titillating: hot summer mornings, few lone calves, and plenty of watchful mama moo-cows with plenty of hound experience. But when Lilla started walking the hounds twice a week at Boone Valley in late July, things got a little more challenging. 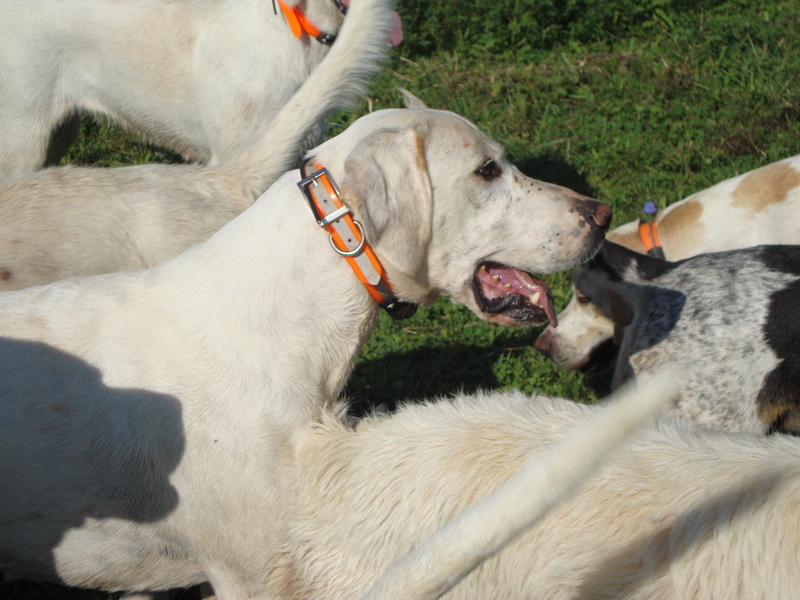 On a recent Saturday, the hounds met up with a herd of curious young heifers who were both forward and prone to run–a mix the puppies hadn’t experienced before and a real test of their discipline. “We do a lot of work with cattle before we ever go to Boone Valley, because those heifers are young and very curious, and when they see something they’re curious about, they’ll surround it,” Lilla explained. “They won’t stand still. And they’re young enough that they’re very mobile. They’re like a school of fish. “That was a really good test of our summer program so far,” Lilla said. “What the hounds didn’t do was switch off mentally and think, ‘I’ve gotta chase that, I’ve gotta chase that.’ What they did instead was make a decision, hear me tell them no, and come back. That’s the invisible thread. “Any pack of hounds, any young puppy, has a tendency to run after what’s moving. You’ll see that during hunt season. Just because a deer flushes out of a covert and a hound gallops a few steps after it, that’s not rioting. If the hound then gets the chance to see it and smell it and then says, ‘Oh, right, I’m not supposed to do that,’ and comes back, that’s what you want. Rioting is when they take those few galloping steps and then switch off to the huntsman and say, ‘I’ve gotta chase that.’ Then you’ve got a problem. 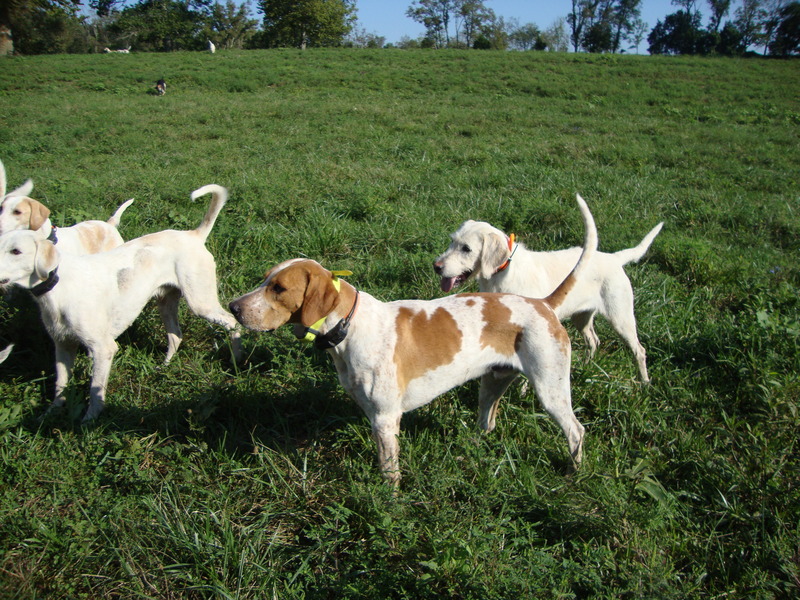 There’s still time for more training this summer: the informal hunting season, which will mark the puppies’ debut, doesn’t start until around October. But already the young hounds have passed some important tests. Next up: horn training. So far, Lilla hasn’t used the horn much at all on hound walks. How can she teach Driver and the BAs what it means? Find out next time, on the hound blog!